Yesterday was an amazing chase day but the setup for Day 3 was looking even better! Our target area was the dryline in the eastern panhandle of Texas where we ended up in the early afternoon. The bases of the storms, however, looked ragged and dry while storms an hour to our east were showing much better potential so after some 30 minutes we decided to give up the dryline and chase those. 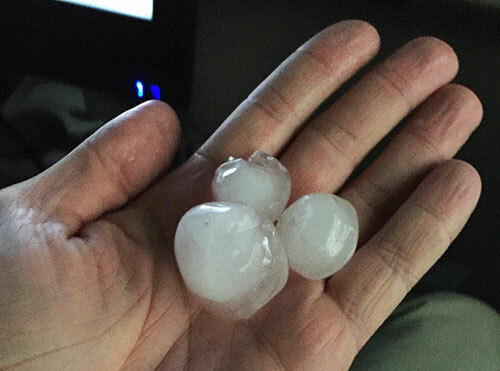 We caught up with the storms around 5 p.m. and picked the south end charlie over the northern storm that had already had a funnel cloud, according to reports. It was a rather wet chase where we often ended up in the strong forward flank downdraft that was rocking our van. Quarter sized hail from the day. One hit me straight on top of my head! The lightning at this point was IMMENSE. I have never experienced any lightning like this before, it was striking down left and right and literally shook the van when it did. It was incredibly powerful and I loved it! When we stopped the second time it did not take much time before the storm was wrapping up and started to look more and more tornadic. 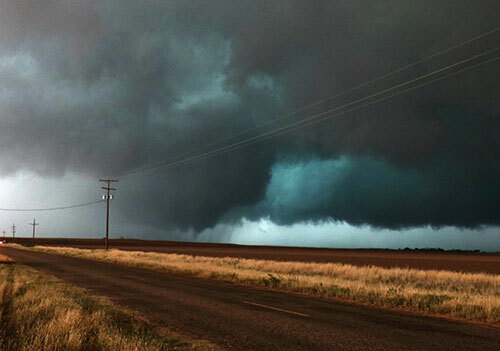 We made a stop when the storm reorganized and creating a new base and that’s when we saw the first tornado of the day. I really did not see it until Erik shouted “Tornado!” again. It was not fully condensed to the ground but rather a bowl with multiple vortices underneath. Those vortices wrapped up to become a wedge tornado that rather quickly disappeared into the rain where we could not see it any more. The tornado in the beginning when it was multivortex (having more than one ‘tornadoes’ on the ground). 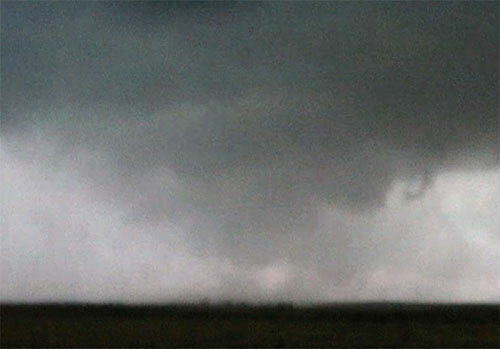 The tornado as it matured into a wedge. As you can see it is not fully condensed to the ground but there were constant fingers dancing on the ground. At the time of the tornado I was expecting it at another place and had my wide angle lens on so my photos and video of the camera is a bit wider than I would have liked, especially since there was so much fine detail action going on underneath. We regrouped and drove through some intense rain before we got up on a hill and saw the cell spawning a brief needle tornado for about 5-10 seconds. I did not have time to bring up my camera so I never caught it on camera. The third tornado was at the same spot. I had some issue with my telescope lens not being able to focus on the low contrast targets so I was still using my wide angle to that distant tornado. It was cool to see a tornado, especially with all the lightning going though. The third tornado of the day. It was far away and shot with a wide angle lens so the image quality is not great. Lightning just when the tornado was just a funnel. Soon thereafter our HP supercell spawned a fourth (!) tornado. 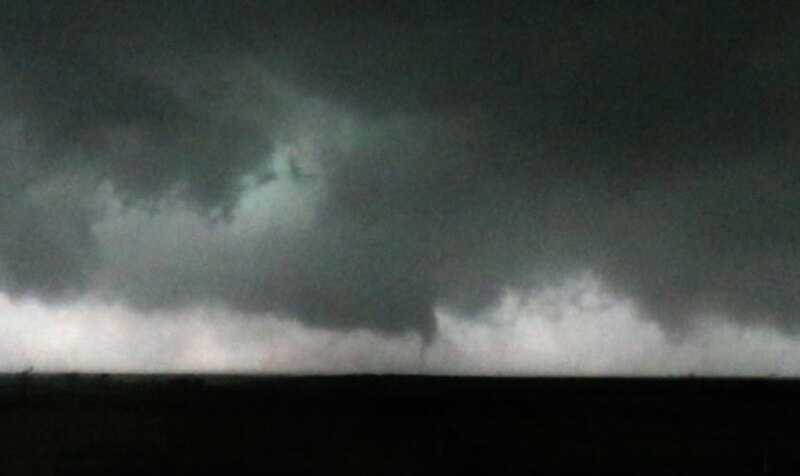 This was a cone tornado but also very brief, not fully condensed and low contrast so it was not too impressive. Still, 4 tornadoes in one day! I did not expect that when we left the dryline earlier that afternoon. 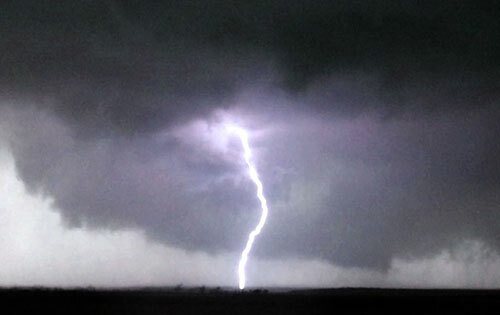 The fourth tornado is barely visible in this video grab. It shows as a cone a bit to the right and behind the central portion. At that point we did not expect to see much more under the rainy conditions we had so we started driving out from the storms passing severely flooded towns. We were lucky to get out of there since many other storm chasers got trapped from fallen power lines and flooded highways! We stopped at Childress, TX, and let the now congealed storm pass over us while having a late pizza at Pizza Hut. Childress was getting a LOT of rain and the lightning was hitting us hard. I feel asleep, dead tired, to the sound of crashing lightning. 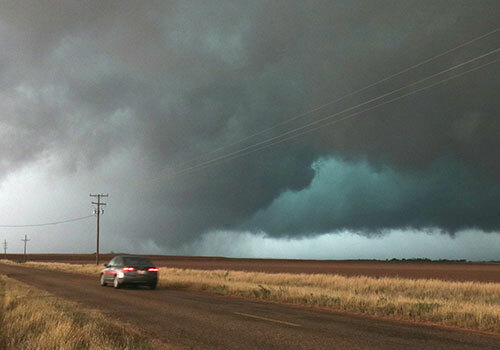 Although I saw a record amount of tornadoes and the first wedge was quite impressive the tornadoes were not very picturesque and we were mostly under rain. This made the “tornado experience” rather mediocre and although that was really cool but what I really loved from this day was the absolutely incredible lightning! There were 32 tornadoes reported that day. 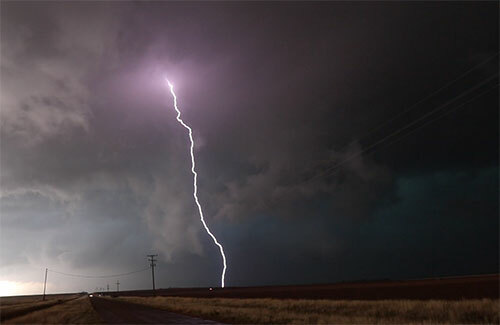 David caught a great wedge tornado in the northern storm and there were reports of tornadoes all the way up to South Dakota! Chase date: May 22nd 2016.